Hair products are really so subjective: what works on my thick, dry, coloured, wavy hair might not suit your long, fine, silky locks. So look out for a few reviews from differing perspectives, starting with the absolutely fabulous Karen, today, who is blessed with a head of beautiful, natural curls. I have to be honest from the start: I don’t really have much faith in the claims made by shampoo companies about what miracles they can perform on my curly, frizz prone locks. 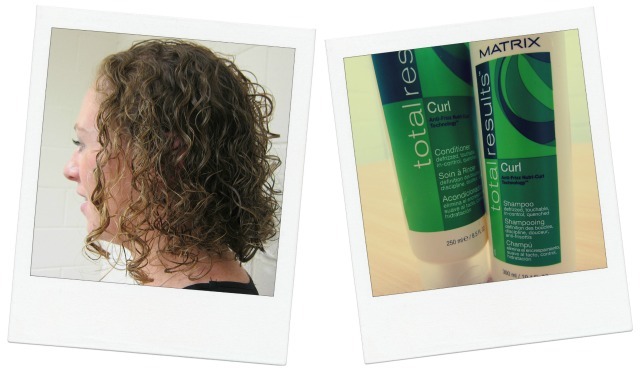 So it’s fair to say I was sceptical when I read the labels on the Matrix Total Results Curl shampoo and conditioner. The shampoo and conditioner claimed they were going to leave my hair ‘defrizzed, touchable, in control and quenched’ - now these are big claims for curly hair. So I started to use the shampoo and conditioner and they definitely feel like a high end product. The shampoo is thick and lathers up with only a tiny drop – so you don’t need to use much. Both the shampoo and conditioner smell amazing – they have that in salon smell that you rarely get from a product at home. For the first week or so I thought they were fine and wasn’t blown away by how my hair looked after using them. However, I stuck with them and I have to say after the second week of use, I noticed that my hair was much smoother. I’m not sure about it being more touchable (although most curly haired girls out there will know that touching your hair is a bit of a no no unless you want to look like a frizz bomb). My hair was also much more moisturised and felt healthier with meant I need to use (slightly) less styling product. Overall I was very impressed with Matrix Total Results Curl shampoo and conditioner and I will without a doubt be purchasing it in the future. The shampoo and conditioner are €6.95; a contouring lotion is also available at €11.95. Any curly haired ladies reading with recommendations of their own, or who fancy giving these a go? Ooh, I'll definitely look out for the conditioner. Thanks for the tip! From one very curly girl to another, skip the shampoo from now on and your frizziness will lessen significantly straight away. I just rinse and condition mine when I "wash" it and use shampoo on it about once a month or less. Thanks so much for this Karen and don't you look adorable?! Great review girl!! Your hair is so pretty! I wish I had curls like yours! It sounds like good stuff, great review! My hair is naturally curly but it depends on the length, if it's short it goes a bit Sonia O'Sullivan (hence it's rarely short), if it's layered I get a pyramid, and if it's long, I'm fairly sure I could fill in for Slash at a push and nobody would cop until I took the guitar up. Nice to know there's something affordable for the days when I don't want to wrestle with curls/frizz/pyramid hair! Nice guest post Karen - good idea Emma to have a few reviews from people with different skin/hair types!